east gable of the chancel in the Church at Daglingworth. 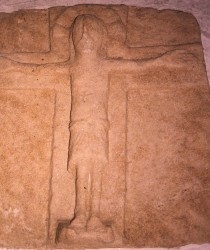 Wall panel showing Crucifixion scene. The cross is in plain rectangular form, and the figure of Christ is without elaboration. He is wearing a knee-length tunic corded at the waist, his feet are side by side, and the face may have had a beard, and did have a moustache. His head is outlined with a nimbus. Taylor, H.M., Taylor, Joan, Anglo-Saxon Architecture 1st, Cambridge University Press, Cambridge. (1965) Stones, Sculptures, Churches, England..